There has been more than one prediction for an upcoming Arctic Blast so it’s time to take it seriously. And we’ve been so lucky lately with the weather these past few weeks, so I guess we’re about due. And today Daryl has been spending most of the time outside getting the cows extra bedding and making sure that all the animals were going to be OK. So when I saw him up by the chicken coop I wasn’t surprised. 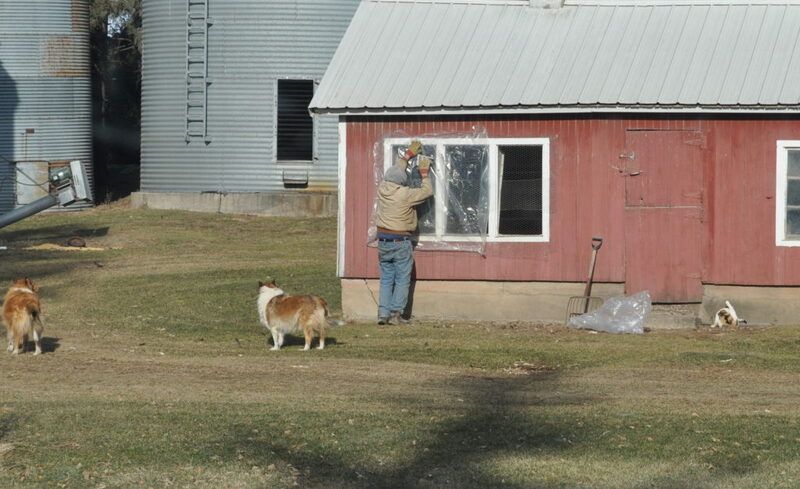 He was putting the plastic over the windows to keep out the upcoming winter weather. Even though we’ll find frozen eggs in the morning – the chickens will be safe! My oh my! Four days and four posts! Congratulations on your candy making day. It looks like you really got a lot done. It’s New Year’s Day, and this morning my husband turned on the cold water at the kitchen sink. There was barely a dribble coming out!! It was 11 degrees last night, and we forgot that the cold water line in the kitchen comes really close to freezing. So I got out the little electric heater and we set it on low , plugged it in, and put it under the sink. We beat the frozen water pipe possibility again! Good luck with the chickens and the frozen eggs!